Determine if You have Acid Rain in Your Area. 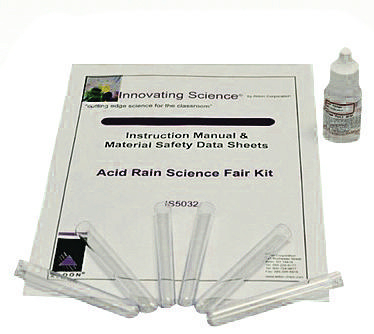 The Acid rain test kit is great to use in the classroom or for science fair projects to determine if you have acid rain in your area. Collect water samples and use a low range pH indicator to determine the pH of your water sample with a colorimetric comparison chart. Ordering information: Includes Low Range pH Indicator, Test Tubes, Color Chart, and Instructions.